This week on MakeKind, I’m sharing a DIY pencil holder that doubles as a mini office organizer. Made from cork trivets, this project is easy to create and super functional – bonus! STEPS // 01 GLUE TRIVETS Using the glue, adhere two trivets together by stacking one directly on top of the other. 03 // MEASURE FOR DRILLING Measure about 2/3 down the stack of trivets and note the measurement. (Mine was 1.5″). On your drill bit, make a mark (I wrapped tape around the drill bit) of the same measurement, so you will know how far to drill into your stack. 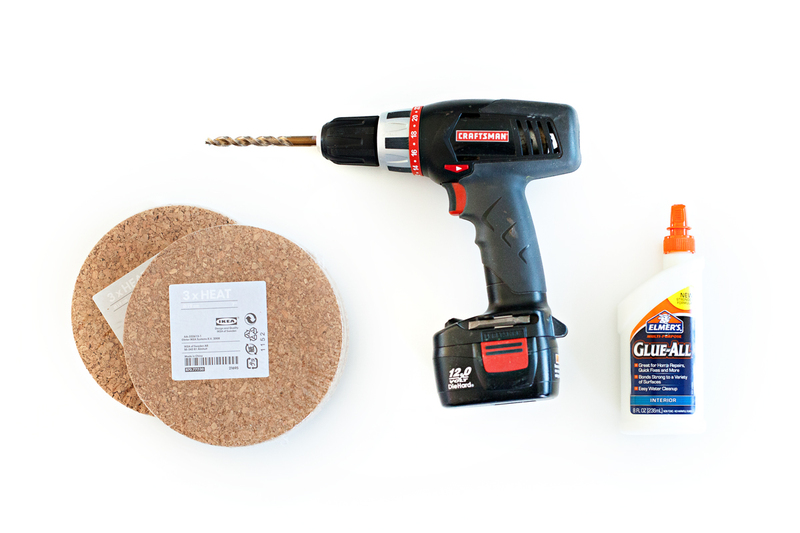 04 // DRILL THE HOLES Using the power drill and 3/8″ drill bit, make several holes in the cork. I put one in the middle and six surrounding the middle, for a total of seven holes. You can certainly choose to make more or less holes depending on your preferences. Fill each hole with a writing utensil and there you have it! The added bonus? Because the pencil holder is made from cork, it doubles as a memo board! Enjoy! Simple but very clever. Great idea! Gosh what a clever idea! TFS this great tutorial. And thanks for the tip with the tape to determine the depth of the hole! I never think of that until I start drilling and then just hope I don’t break through to the other side. I love this, and will make it when get the cork. It could also be used for sharp implements on a craft table! presently I use polystyrene but prefer the look of the cork. might not even need to drill holes either. or could drill holes in half and place sharp things on other half. I might want to weight the bottom somehow too. Pingback: 20 Best 20 | Office Overhaul! I love, love, love this! I have some leftover cork board from Ikea that I wasn’t sure what to do with it and now I know what I’ll be doing. I’ll probably spray paint mine with a gilded color or something like that. But what a great d.i.y office/workspace project! Pingback: Подставка для карандашей своими руками. (Мастер-класс) | Дизайн для детей.